There’s no better way to someone’s heart than their stomach. Here are three recipes that will impress no end, but are easy to prepare. This classic simple summer dish from Piedmont is easy to prepare and should be done a day in advance. Make an impression by making your own tuna mayonnaise with this recipe inspired by the great Elizabeth David - you just need a stick blender, a light-flavoured olive oil (a peppery one will be quite overpowering) and very fresh eggs. You can use store-bought, but if you do, go for a thick, full fat, savoury one for the best taste (Japanese mayonnaise is ideal). Sear the meat in a hot pan until browned on all sides, then transfer to the oven and roast for 15 minutes at 180C or until blushing pink inside (if you have a meat thermometer, it should reach 60C). Set aside to rest and cool. For the tuna mayonnaise, with a stick blender, blend the egg yolks while slowly adding the olive oil (very slowly at first, just a trickle), whisking constantly until a thick emulsion is formed; only add more oil when you have an emulsion. Add the salt, tuna and lemon juice and blend again until you have a thick mayonnaise. Taste and adjust the seasoning or add a little more lemon juice, if needed. When the meat has cooled, slice it into five-millimetre-thick slices. Spoon over the tuna mayonnaise. Leave in the fridge overnight. (If you prefer, you can spoon over the mayonnaise at seving time.) The next day, remove from the fridge about 30 minutes before serving and scatter the chopped parsley and capers over the top. Serve with a crisp green salad. 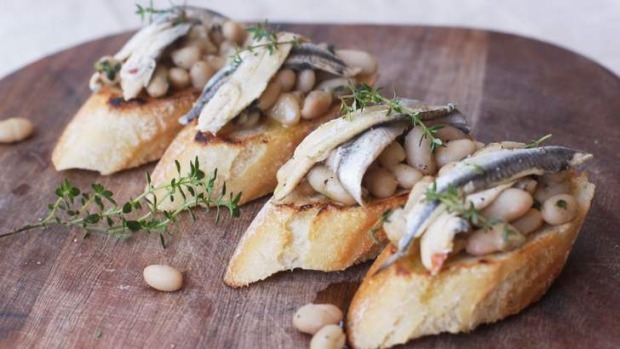 If you've never tried marinated white anchovies before, you've been missing out. They don't have the briny, strong flavour of their darker, more common cousins. White anchovies are delicate, melt-in-the-mouth and pleasantly sour, thanks to their marinade. Paired with creamy cannellini beans and fresh herbs, this makes for an appetising start to the meal. You can find marinated white anchovies in good delis. Warm the cannellini beans over low heat in a small pan with one to two tablespoons of olive oil and the garlic clove, flattened with the back of the kitchen knife. Saute gently for a few minutes until the garlic becomes fragrant. Add the fresh thyme leaves, along with a small pinch of salt and plenty of black pepper. Take off the heat and top each grilled crostino with a mound of cannellini beans, followed by two fillets of white anchovies, drained of the marinade. 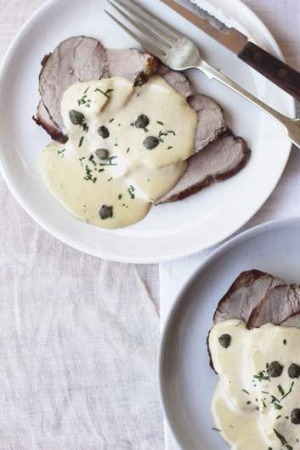 Season with more black pepper and finish with a drizzle of extra virgin olive oil. Valentine's Day calls for a luscious, silky dessert. And chocolate, naturally. 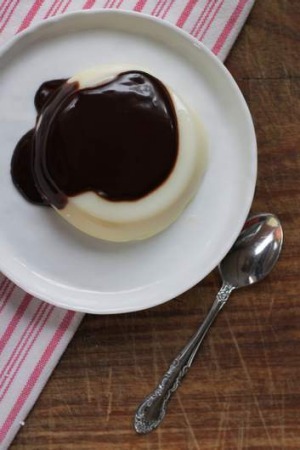 As classic panna cotta is rather plain, this rich, bittersweet sauce - more of a ganache, really - makes it quite decadent. It's a simple, quick dessert to make - you can do it the night before and not think about it until just before serving. Combine the cream, milk, sugar and vanilla in a saucepan and heat until the sugar dissolves; don't let it boil. Remove from the heat. Soften the gelatine in two tablespoons of water. Whisk some of the hot cream mixture into the softened gelatine, then transfer the gelatine mix to the pan of cream and whisk until well combined. Remove the vanilla pod and divide the cream into four ramekins (a silicone muffin tray works well too). Refrigerate overnight or until slightly wobbly but set. When about to serve, make the chocolate-espresso sauce. Melt the chocolate with the coffee and sugar over a bain-marie - sit your bowl over a saucepan of hot water on the stove-top. Stir until evenly melted, then take off the heat and stir in the heavy cream. Let cool slightly. Turn out the panna cotta on to small plates (you can dip the ramekins into a bowl of hot water to loosen the edges slightly - don't go overboard, you can easily melt them) or serve in the ramekins, with plenty of slightly warm chocolate sauce on top.